When the father sees his returning, prodigal son at a distance, he is moved with compassion and rushes out to him (Lk. 15:20). He embraces him and welcomes him back home as his son and not merely his servant. Moved with compassion for the widowed mother who has just lost her only son, Jesus stops the funeral procession and restores the son to life (Lk. 7:11-16). The Greek verb for “moved with compassion” is found only in Matthew, Mark, and Luke. Sometimes it describes Jesus’ response to others; other times, Jesus uses the term in certain parables. In the Gospels, being moved with compassion always serves as a prelude to or motive for action on behalf of others. Despite its apparently visceral origin in our inner parts, “compassion” is less a raw emotion than what might be regarded as an attunement (an Einstimmung to borrow loosely from Heidegger). In Patristic texts, compassion is often linked with sumpatheia, which is often translated in Latin as “compassio” in the sense of a capacity, if you will, to identify with the suffering of another. Compassion makes us aware of others who are afflicted or in distress and it draws us towards them. Moved with compassion, the Good Samaritan “comes near” to the beaten man. Moved with compassion, even while his son is “a great way off,” the father runs towards the prodigal son and embraces him. By way of comparison, although the Priest and the Levite see the beaten man, they pass by him on the opposite side of the road. Jesus does not tell us what moves these men to deliberately avoid the man, but the clear intention of the parable is that both lack any acute sense of sumpatheia or of mercy. Compassion then is distinguished from pity at least in the sense that pity involves merely feeling sorry for someone while yet remaining aloof, distant, superior to and disengaged from that person. Compassion, thus, leads to “good works” that render mercy and assistance to others. Of course we call these good works alms or, in a broader sense, works of mercy. Our prototype for such compassionate works is, of course, God Himself. Even after our sinful rebellion against Him, he did not abandon us but “because of his tender compassion” visited us in various ways (Liturgy of St. Basil just before the recitation in the Anaphora of the events of salvation history). In the Divine Liturgy, we are reminded that God is merciful and compassionate (Ps. 102:8, the first Antiphon) and that the scope of these works includes “giving food to the hungry, setting the prisoners free, giving sight to the blind, lifting up those who are bowed down, watching over the sojourners, and upholding the widow and the fatherless” (Ps. 145:7–9, verses of the 2nd Antiphon that we, regrettably, rarely sing). Not surprisingly, then, the scope of alms is substantively broader than merely giving material aid or money. Works of mercy comprise all our personal actions to assist those who are in need and distress, whether spiritual, mental, or physical. Personal works of mercy can and should extend to efforts to change social structures and policies on behalf of, as well as to advocate for, those who are poor, vulnerable, or treated unjustly. But what about corporate works of mercy or actions that are undertaken by a community in which there is a “we” who collectively and collab-oratively acts as a community, be it a local church, a monastery, or the gen-eral assembly of an autocephalous Church. Why should Orthodox Christ-ians be concerned about cultivating such activity rather than simply the merciful activities of individual persons? Behold, the church and the house of hospitality: the one for the worship and correctness of right faith and praise of the love of God and so on, the other for the love of neighbor (and “neighbor” means all humankind) for “I was a stranger and you welcomed me” (Matt. 25:35) and other similar commandments of the Lord. As the Lord himself says, “On these two commandments depend the whole law and the prophets” (Matt. 22:40), [that is] on the love of God and neighbor. For these things the church and the hospice were provided. There are many specialized studies that allow us to gain some understanding of the nature and scope of these corporate activities, but there is almost nothing, as far as I can tell, in our service texts or icons that serve to commemorate them. Consider these examples drawn from the lives of St. John Chrysostom and St. Basil the Great—two of our three hierarchs or ecumenical teachers. Fr. Georges Florovsky famously referred to St. John Chrysostom as the prophet of charity. Anyone familiar with St. John’s many homilies knows how passionate he was about the importance of caring for the poor and others in need. However, of the many hymns and other texts for his feast day, there is only one text that I find—an aposticha verse—that acknowledges him as “… true Father to orphans, prompt help of the distressed, support of the poor, nourisher of the hungry, staff for those who are falling.” His biographies note that he founded various hospitals. St. John himself mentions that the Church (most likely in Antioch) provided for 3,000 widows daily plus others in prisons, those who were infirm, etc. This must have been a rather highly organized undertaking which St. John obviously did not undertake by him-self but for which he most likely at best provided general oversight. Sadly there is almost no surviving record of how this activity was carried out. But there is also no day in the church calendar on which we commemorate or even remember the church in Antioch, or the many other churches and Christian communities in the 4th century, for undertaking the daily feeding of the poor and other works of hospitality. St. Basil the Great was also one of the great episcopal benefactors in this period. As with St. John, there is one service text for his feast day, January 1, which clearly acknowledges this: “Treasure of the poor, father of orphans, protector of widows, consoler of the afflicted, O holy Basil, you were also the pilot for the wealthy, the instructor for youth, the staff for the elderly; and for monks, a model of virtue” (Troparion, Canon ode 7). His vita mentions that he spent his wealth and the income of the church on behalf of the poor and destitute and ”in every center of his diocese he built a poorhouse; and at Caesarea, a home for wanderers and the homeless.” (OCA life of St Basil). In Caesarea he established a “new city” outside of Caesarea, as St. Gregory the Theologian referred to it, which consisted of a hospital and other buildings attached to a monastery that provided care for lepers, respite for travelers, and so forth. We know practically nothing about the daily activities of this complex except that it was supported by the corporate activity of the monastery’s monks. But, again, so far as I know, there are no service texts or days to commemorate this monastery or any others for their corporate philanthropic activities. As with our service texts, Orthodox icons focus almost exclusively on individual saints. Nearly all of our icons of saints present them alone or in groups but almost never, so far as I know, as engaged in collective action together. We get at best some intimation of the activity of a community in the icons of St. Maria Skobstova and those with her but only because of what we know of their work together. I obviously do not want to diminish the important witness of the holy men and women whom we venerate as saints. Their lives and icons rightly serve to portray them as prime examples of our god-bearing fathers and mothers who remained steadfast in their faith and in their manifestation of God’s love in the world. Yet, as Jim Forest notes, the icon shows “the recovery of wholeness…. [It] suggests the transformation that occurs to whomever has acquired the Holy Spirit…. [It is] thus a witness to theosis, deification.” There are, of course, many icons of Christ performing works of mercy as exemplified by the first icon shown in this essay (pg. 14). But does the nearly complete absence of icons and service texts commemorating the collective or corporate works of mercy of Christian communities suggest that these activities are somehow outside the pale of transform-ation or deification in the Holy Spirit? Of course, if there are no clear exam-ples of icons or service texts commem-orating corporate works of mercy, there are the icons and service texts that commemorate the fathers of the various ecumenical councils. These icons repre-sent the Fathers of the Church acting together with one another in an organ-ized, corporate manner to resolve the various issues that were presented to them at the councils. These icons, especially those which represent the Fathers of the Church gathered in semi-circles across from one another recall the icon of Pentecost. This icon, of course, represents the new community (ecclesia) that overturns the breakdown of communication and collaboration that plagued the construction of the Tower of Babel (Aposticha, Vespers for Pentecost). 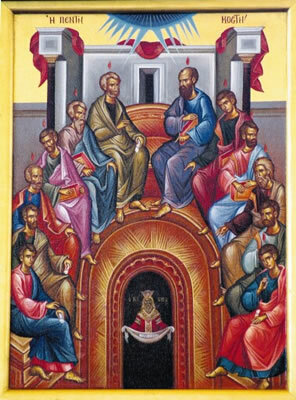 The unity and repose of the apostles in the icon for Pentecost provides the basis for their collective and united activity in the church. It was the apostles, at least those in Jerusalem, who collect-ively managed the gifts that were laid at their feet in the first Christian community (Acts 4:35); it was the apostles who collectively appointed the seven for ser-vice in the early community (Acts 6:1-5). It was the apostles and other elders in the church who met at the very first council of the church and who collectively acted on various matters “as it seemed good to us and the Holy Spirit” (Acts 15:28). Each social grouping—family, parish, diocese, church council, school, office, factory, nation—has as its vocation to be transformed by grace into a living icon of [the Holy Trinity], to effect a reconciling harmony between diversity and unity, human freedom and mutual solidarity, after the pattern of the Trinity. The realization of this vocation is obviously impossible unless human beings collaborate with one another in actions that have the corporate, social nature of a “we” who act. Such social action has a structural character to it that cannot be reduced merely to the sum or conglomeration of purely independent individual actions. For example, the outreach ministry or Christian education program of a parish typically require the blessing of the rector, the support of the parish council, and funding provided from the parish budget or other sources. Individuals who work in the programs act as representatives of the parish. The programs themselves require some organization, a division of labor, etc. Such programs, in other words, are carried out by people acting in a collective manner and not merely as isolated individuals acting on their own behalf. Alas, while I am unaware of any icons that commemorate communal works of mercy undertaken by various Christian communities, there is one notable exception in some of the icons of the Feeding of the 5000. This miracle is recounted in all four gospels (Matt. 14:13-21, Mk. 6:31-44, Lk. 9:10-17, and Jn. 6:5-15). On the one hand, the story receives a Eucharistic interpretation in which Christ’s miraculously feeding the people prefigures the Eucharist. Not surprisingly, the icon for this event that evidently stresses a Eucharistic interpretation focuses almost exclusively on Christ. Yet in each of the Gospel accounts, Christ tells the disciples that they should feed the crowd even though they want to send them away. They are incredulous that they can feed them since they only have two fish and five loaves. Christ miraculously multiplies the loaves and fish, but he gives the food to the disciples and they distribute it. Without losing a Eucharistic interpretation, this event also has the simple, literal meaning that Christ to-gether with the disciples fed a large crowd at the end of the day when they were hungry. In this second icon, Christ blesses the food and the disciples actively distribute it. This icon manifests the corporate action of the disciples together with Christ in feeding the 5000. That is, if Peter had gone home to his wife at the end of the day, he would have recounted the event by telling his wife about the miracle that Jesus performed and about the fact that “we disciples” distributed the food after Christ blessed it. The feeding of the 5000 then was the action of a community. Again without losing the Eucharistic interpretation of the event, the story and the second icon serve as the prototype for a work of mercy performed by the community of Christ and his disciples. I’ve not been able to find an icon for the event of the Christ’s first commissioning of the disciples. But that event also initiates collective or corporate action. Jesus does not simply send the disciples forth to act as autonomous individuals in their own names. They are sent to preach the word of God, to heal the sick, cast out demons, etc. as members of the community of the disciples whom Jesus had called. Whether they traveled in groups of two or individually, but not as a single group, they still acted as members of the community of Jesus’ disciples. In any event, I think we can combine a set of icons in which the corporate works of mercy of a community reflect and manifest the “collective” compassionate action of the Trinity towards the world (opposite page). In its own way, then, the icon of the Feeding of the 5000 pulls all of these themes together. Given a Eucharistic interpretation, the icon manifests Christ Eucharistically giving himself to the faithful through the priestly ministry of the apostles. The icon also manifests what we might call the liturgy after the liturgy: the Eucharistic community of the church facing the world in order to feed those who are hungry through the material gifts of food that Christ supplies. Christ’s neighborly presence to the community of the faithful in the Eucharist is simultaneously repeated in the neighborly presence of a Christian community engaged in works of mercy. if we want to become…a Christian community, a community of people who love one another earnestly, if necessary sacrificially, whose love is prepared to go as far as crucifixion, then we must learn a great deal about our attitude to each other. How can we contemplate the vision of the Cross if we are not prepared to carry one another's burdens, to identify in sympathy and compassion with each other? But compassion, as I noted above, has no borders. The very cultivation of compassion among the members of a Christian community has to extend to mem-bers outside that community. How can people claim to belong to compassionate Christian community and yet be oblivious to and unengaged with people outside the community? Conversely, if we always receive Christ’s loving gift of himself as members of a Eucharistic community, how can the community not manifest that same love through “facing the world” in a compassionate and neighborly manner? Each Orthodox Christian community must face the world if it takes seriously the mission of the Church to bring the Word of God to the world through evangel-ization. But the Word of God did not simply preach to people. When crowds of people came to Christ with “those that were lame, blind, dumb, maimed, and many others,” he healed them. After they spent three days with Christ, he refused to send the crowd away hungry, but “moved with compassion,” he blessed the meager food the disciples had and mobilized them to feed the people (Matt. 15:30-38, Mk. 8:1-6). almost all houses [monastic communities] distributed alms to the poor and to travelers at the gate and provided food and lodging in the guesthouse, and many of them assisted orphans, prisoners, and women who lacked the wherewithal for dowries. The hospital associated with the Pantokrator in Constantinople was unique, but many houses supported hospices, old age homes, and hospitals, and also bridges, which were considered a worthy object of charity. In a similar way, a compassionate response to assisting those who are poor is in principle critically sensitive to attitudes and policies that seek to blame the poor entirely for their poverty. One need only read St. John Chrysostom’s many homilies dealing with poverty to see how often he caustically rejects claims by parishioners that the poor did not deserve assistance since they were to blame for their condition. Indeed, St. John pointedly rejects any appeal to Jesus’s remark that “the poor are always with you” to justify spending money on beautifying the Church at the expense of directing funds to support the poor and others in need. For what is the profit, when His table indeed is full of golden cups, but He perishes with hunger? First fill Him, as one who is hungry, and then abundantly deck out His table also. Do you make Him a cup of gold, while you do not even give Him a cup of cold water? And what is the profit? Do you furnish His table with cloths bespangled with gold, while to Him you do not afford even the necessary covering? To be sure, St. John is addressing parishioners who would rather have donated money to the Church than to those who were poor. But is there any reason why a parish community should not consider this text to be relevant when it considers how to use its own time, talents, and resources? If it did, it certainly could not automatically justify simply turning entirely towards its own internal “needs” rather than cultivating a communal commitment to facing the world in a compassionate manner. Such a community would not use a text like “the poor shall always be with you” to justify some inevitability or divine sanction to poverty, among other things, as a reason for avoiding compassionate engagement with the world. St. John Chrysostom certainly did not think that poverty in his day was inevitable. He thought it could be eliminated, at least in extreme form, if people were sufficiently willing to share economic resources with one another. Indeed, while St. Cyril of Alexandria acknowledges that in this text, Jesus gives a certain precedence to honoring him over serving the poor or doing works of mercy in general, he denies that this precedent is absolute. In fact he writes that Our Lord himself tells us “it is not necessary always without intermission to devote our time to honoring Him, or to spend everything upon the priestly service, but rather [we should] lay out the greatest part upon the poor.”St. Cyril notes that while, at the command of Christ, the apostles devoted themselves to prayer and fasting between his Ascension and Pentecost, they afterwards “eagerly spent all the offerings that were brought to them upon the poor.” They did this as leaders of and on behalf of the Church. The Church, in the Byzantine era, including its monastic communities, often provided the essentials of social security for a large segment of the population of the Empire throughout its existence…it took under its aegis orphans, widows, the old and the disabled, the stranger and the unemployed; it saw to the release of prisoners of war and of those unjustly detained. Moreover, Orthodox Christian communities that endeavor to face the world around them in a neighborly, compassionate manner should not shun, but in fact should cultivate, the critical dimension of compassion. There is absolutely no reason why a Christian compassionate attunement to the world should be blind to social and structural factors that harm people. In 2009, for example, the Diocese of Alaska (Orthodox Church in America) “passed a unanimous resolution opposing any development that may be harmful to the people or land of Southwest Alaska.” The resolution was passed in opposition to the development of the Pebble Mine in Alaska. In 1989 at its Ninth All American Council, the Orthodox Church in America passed a motion supporting “the abolition of the death penalty in this and all countries” and further recommended that “legislative provisions be made for life imprisonment without possibility of parole for those subject to the death penalty.” Examples like these certainly suggest that there is good reason in principle for Orthodox communities to address as appropriate the institutional and social factors that promote or block the compassionate treatment of people in their local communities.